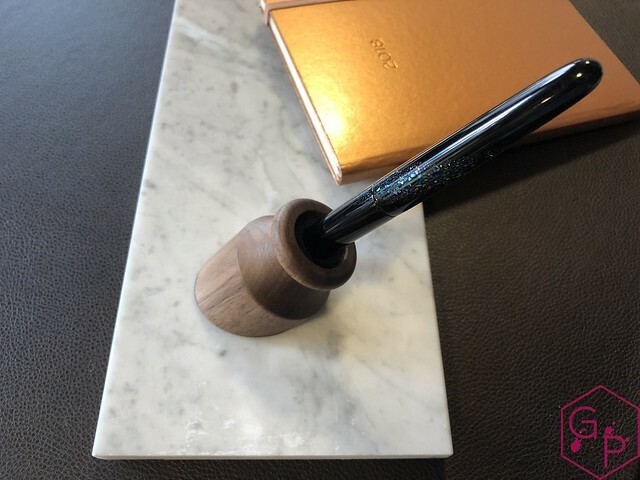 Thanks to Good Made Better for sending this pretty pen well for me to test out and review! 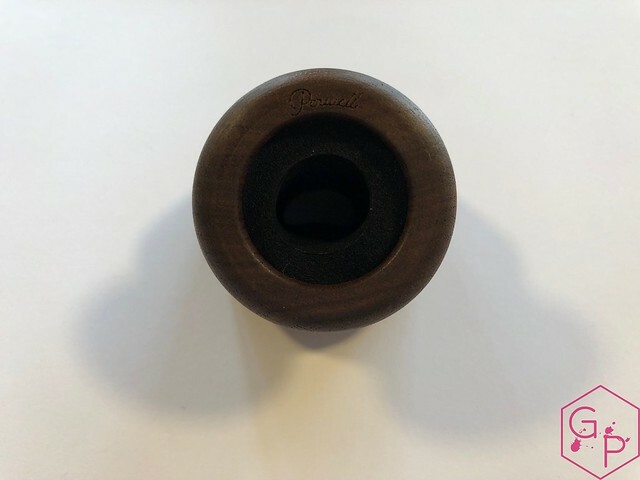 The Penwell was designed in, and are manufactured and assembled in, South Dakota, USA. 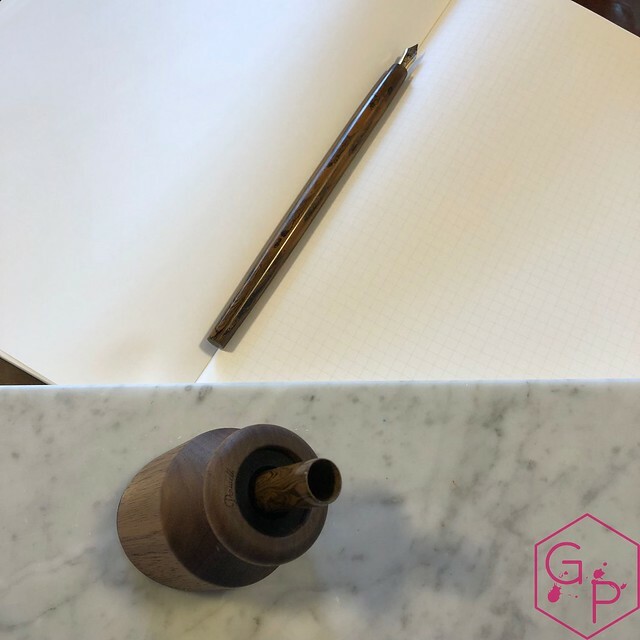 The idea of the pen well is to have an attractive unit that can convert your fountain pen (or ballpoint) into a desk pen. 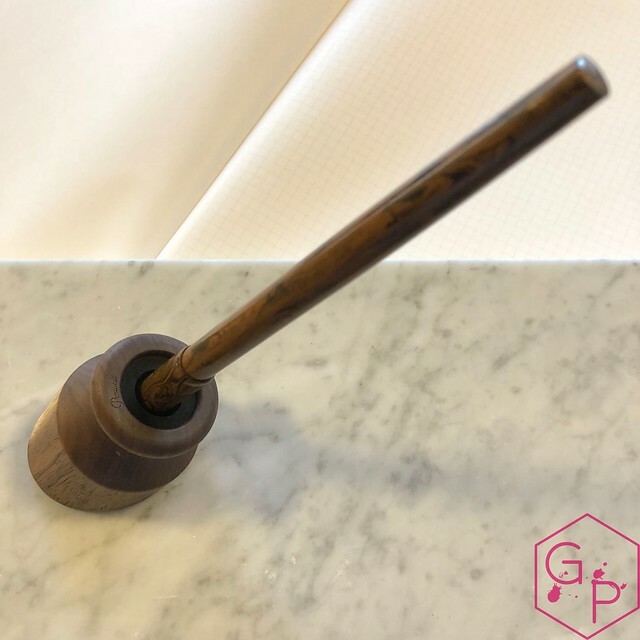 That is, a pen that you pluck from a stand and it is ready to write! Desk pens and desk pen stands have of course been around for a long time. 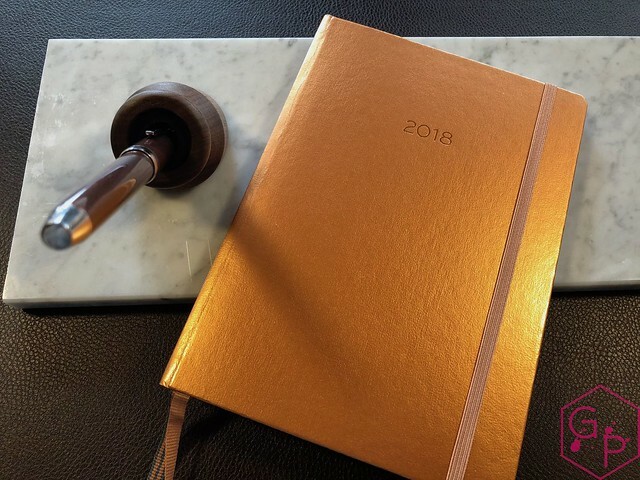 Now even your favorite pen can be used as a desk pen! Note: at the time of this review, Good Made Better was called Penwell Co. It has since been renamed. 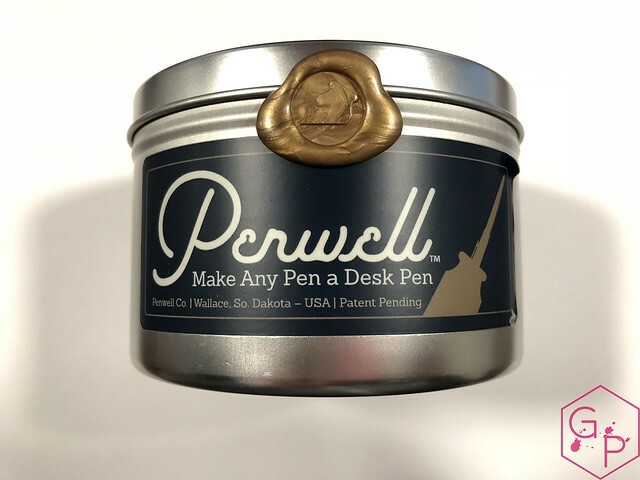 The Penwell is presented in a round tin with a removable lid. 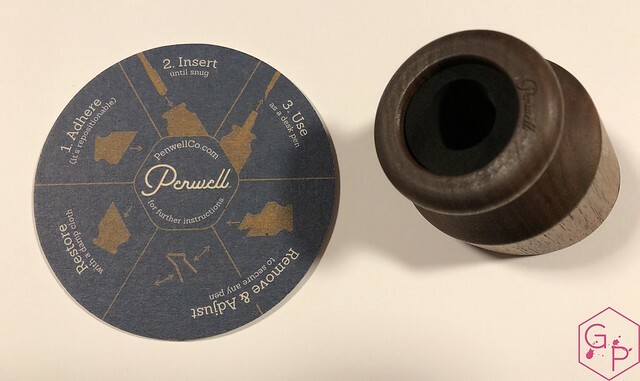 There is a Penwell logo sticker on the side along with a wax seal for an added finishing touch. Inside, there is a Penwell coaster and the pen well itself securely held in place in a snug foam cutout. I like the tin. It's nice, tidy, and cute. Presentable, reusable, and ideal for storing little items that get lost otherwise - paper clips, hair ties, peanuts. 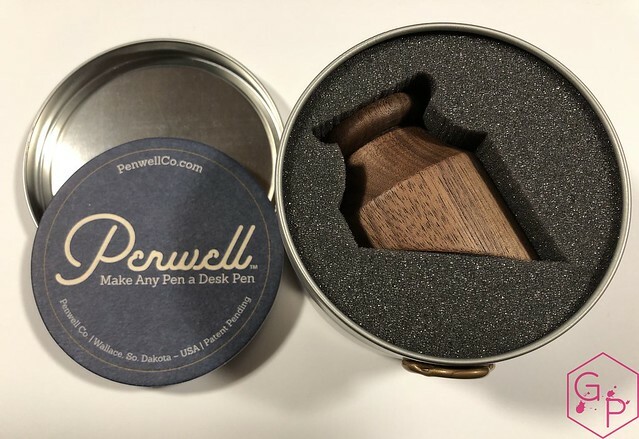 The Walnut Penwell is small and cute. It sits flat and the mouth opens at an angle. "Penwell" is subtly engraved on the lip of the opening. 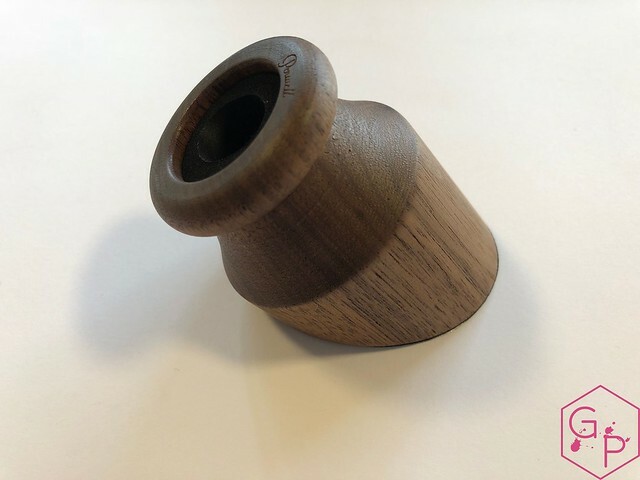 The bottom has a micro-suction ring and the inside has a foam liner with a metal structure for holding the cap. It's a simple unit but looks quite nice. I prefer the Walnut over the metal options but the ceramic limited edition was the best! The Walnut has a smooth finish and it has dark streaks that highlight the beauty of the wood. It has a hand rubbed oil finish that gives the wood depth and a hint of sheen. It's finished well and doesn't have any rough bits. It looks so cute on my desk! There are installation instructions on the Good Made Better website. It's very easy - find a place and stick it on a clean surface. I had no issues placing various fountain pens into the foam mouth. I simply inserted the pen until it felt snug. I did try lacquered pens and there were no visible scratches upon removal. I took the risk to test my pens for you but just in general, I think I would not recommend putting very delicate finishes in a snug foam mouth, especially if you like your pens pristine. It performed exactly as described. It allowed me to leave a pen cap in place and when I needed my pen, I either unscrewed the barrel or popped it out (for snap caps) from the base, wrote, and replace the barrel. Pens with really snug slip caps were tricky. I had to wiggle the pen and rotate it slightly. 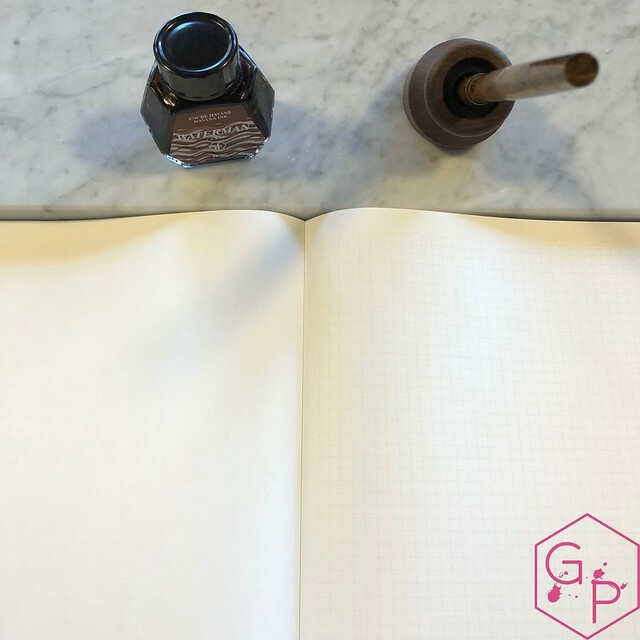 Some pens have a looser slip cap, others are really tight so it depends on your own. Ultimately, it is ideal to use with threaded caps because no yanking is required. 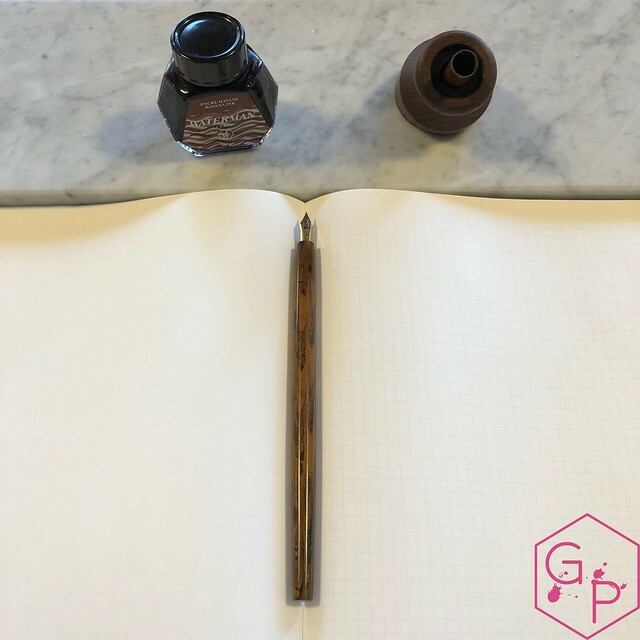 The main issue I had with a snug slip cap was in the case of an eyedropper pen - every time I managed to yank the pen out of the stand, ink splattered in the cap and sometimes on the desk. Removing/moving the Penwell is simple. Grip the base and lift, wriggling as you go. I placed and removed my Penwell three times and it continues to work, but I am always careful to clean the surface before I place it. I did notice some indentation in the foam from larger pens. It restored almost to its original shape, save the little dent. I did not really notice any effect on gripping caps. Wider pens do not need to go in very deeply and slimmer pens fit deeper in the mouth. I did not try really, really wide pens - like Jumbo-sized pens because they're not really the kinds of pens I wanted as a desk pen. 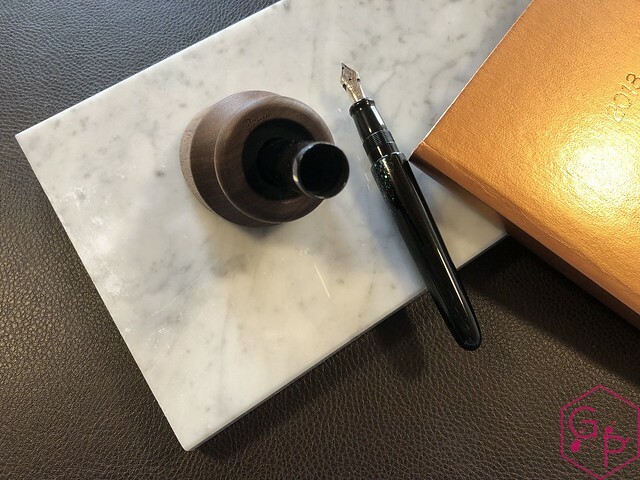 Affordable accessory to turn your fountain pen into a desk pen! 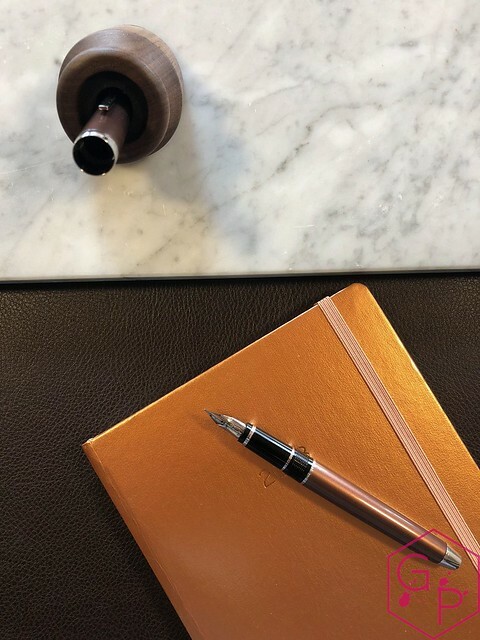 Great gift idea for a new and budding fountain pen lover, or an existing pen lover. Simple, attractive presentation with minimal waste. Can be moved around - not a one-time use item. Designed, manufactured, and assembled in the USA. Works well for turning your pen into a desk pen! Can be tricky with pens with snug slip caps - easier to use with screw caps. Foam can be compacted by wide pens. I actually have few complaints about the Penwell. It's easy to use and worked well with the pens I wanted to have always at the ready. 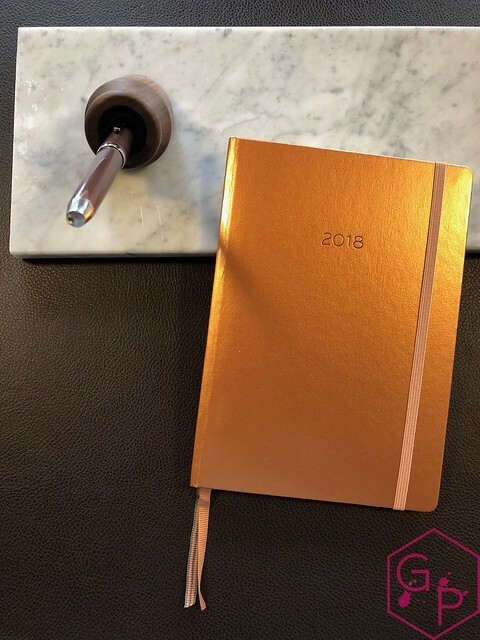 It's a cute accessory, a great gift idea for the pen lover in your life. I feel like the price - although not inexpensive - is not unfair, in my humble opinion. The Walnut is beautiful but the one that really appealed to me was the ceramic small batch that has since sold out.